A Pennsylvania Republican lawmaker delivered a fire and brimstone prayer aimed at an incoming Muslim member of the statehouse Monday, prompting outrage and accusations of bigotry. Rep. Stephanie Borowicz, a Republican from central Pennsylvania’s Clinton County, opened the day’s session with a prayer that called for the country to ask for God’s “forgiveness” for, in her view, turning away from Christianity. “God forgive us, Jesus, we’ve lost sight of you, we’ve forgotten you, God, in our country, and we’re asking you to forgive us,” said Borowicz. The meaning of the prayer wasn’t lost on state lawmakers. Monday marked a historic first in the state as state Rep. Movita Johnson-Harrell, a Philadelphia area Democrat, was sworn in as the state’s first Muslim woman representative. “It blatantly represented the Islamophobia that exists among some leaders, leaders that are supposed to represent the people,” Johnson-Harrell told the Pennsylvania Capital-Star in a statement. In remarks to reporters on the statehouse floor, Johnson-Harrell expressed disappointment with Borowicz’s behavior. Johnson-Harrell’s fellow Democrats were outraged at what they saw as Borowicz’s targeting of the newly-elected representative and her faith. “What we do not need is to see prayer and religion twisted to intimidate, discourage, or subtly degrade any Pennsylvanian, especially one sent by her constituents to represent them in Harrisburg,” House Minority Whip Jordan Harris said in a statement. 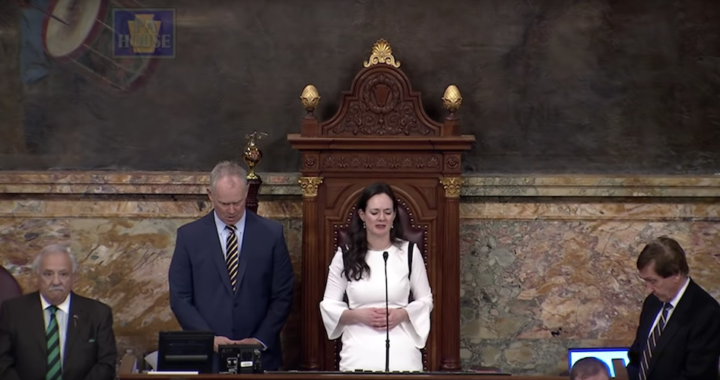 Rep. Summer Lee, a Democrat from southwestern Pennsylvania, placed the blame squarely on Speaker Mike Turzai, a Republican, for inviting Borowicz to deliver the prayer in the first place. “This fire and brimstone Evangelical prayer was before the swearing in ceremony of the PA House’s first ever Muslim woman,” tweeted Rep. Kevin J. Boyle, a fellow Democratic state representative from Philadelphia, who said he walked off the floor of the House in protest. “It is the epitome of religious intolerance,” Boyle added. I walked off the House floor in protest during today’s prayer led by a GOP member from Central PA. This fire and brimstone Evangelical prayer was before the swearing in ceremony of the PA House’s first ever Muslim woman @movitajh It is the epitome of religious intolerance. Borowicz was undeterred by the criticism, she told reporters.